Hundreds [about two thousand in fact] of people have gathered to demonstrate against the possible expansion of Heathrow Airport. 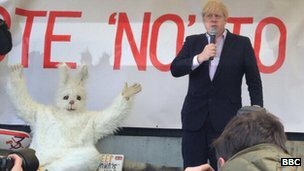 Mayor of London Boris Johnson and Zac Goldsmith MP for Richmond Park and North Kingston have spoken at the rally in Barnes, south-west London. Last September, the government launched a review of how the UK might expand its airport capacity in the South East. One long-standing option has been to add a third runway at Heathrow. Heathrow is one of the world’s busiest airports, handling more than 69 million passengers a year. Mr Johnson said the expansion of Heathrow would be a “giant step backwards for London”, giving rise to “great flying fleets of fortissimo flatulence”. He told BBC London the alternatives offered by Gatwick, Stansted and two sites in the Thames Estuary should be concentrated on, and the idea of Heathrow expansion “closed down”. He said Prime Minister David Cameron was keeping his cards close to his chest. Conservative MPs Mr Goldsmith and Justine Greening, MP for Putney, Roehampton and Southfields. also spoke to protesters. Sean McKee, director of policy at London Chamber of Commerce, said London is a “global city in an island economy”. He said there was a race between European capitals to see who could connect and trade with Asia, Africa and South America, and Heathrow provided the best opportunity. Mr McKee said: “I think it’s quite simplistic for those local politicians in west London to claim that everybody inside their boundary opposes Heathrow expansion. But one resident, who has lived in Kew for 10 years, told BBC London the noise from flights already affects people’s health. “With an extra runway the respite we get either in the morning or the afternoon could disappear,” he said. A commission chaired by ex-Financial Services Authority boss Sir Howard Davies, is to consider a number of options to expand capacity, including a new airport to the east of London. A spokeswoman for the Department for Transport said: “Previous attempts to tackle the question of airport capacity have failed, often due to a lack of consensus on the evidence. Today’s impressive rally against Heathrow expansion, organized by Zac Goldsmith MP, demonstrated the formidable forces that are massing once again to prevent expansion of the airport. It will have given Heathrow Airport and their allies who want a third runway considerable pause for thought. In the space of 40 minutes 15 leading politicians from right across the political spectrum lined up to speak. They included the Mayor of London and two cabinet ministers, Justine Greening and Ed Davey. And many more politicians wanted to speak but had to be turned away. Airport expansion – like every major decision – will be a political one. And the politics are moving away from Heathrow. Politicians of all parties are putting Heathrow expansion in the “too difficult” box. The Liberal Democrats are firmly opposed. The Labour Party, under Ed Miliband and shadow transport secretary Maria Eagle, has made it clear it no longer supports expansion. There is a powerful lobby within the Conservative Party which is urging the Party to rule out expansion for good. The London Assembly and the Mayor are united in their opposition to it. Look around the cabinet table: the Deputy Prime Minister Nick Clegg, Business Secretary Vince Cable, Home Secretary Theresa May, the Secretaries of State for the Environment, International Development andNorthern Ireland, Ed Davey, Justine Greening and Theresa Villiers and Defence Secretary Philip Hammond are all known opponents. This is a far cry from the opposition being confined to local authorities, local residents and environmental groups. Heathrow has become a London-wide, indeed a national issue, a national issue where politicians know there are votes and seats to be won and lost, where they are so aware of what happened to the last Labour Government’s attempt to expand Heathrow. Astute people within the aviation industry like Willie Walsh, in charge of British Airways, have made their view clear that the tide has turned against Heathrow expansion. Today’s rally re-enforced that message. Hundreds of people turned out for a rally today against proposals to build a third runway at Heathrow Airport. 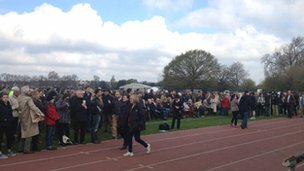 The rally was organised by Conservative MP for Richmond Park and North Kingston Zac Goldsmith, and among those who attended this morning’s event in Barn Elms playing field in Barnes was Mayor of London Boris Johnson. The Mayor has previously accused David Cameron of kicking the matter “into the long grass” by delaying an independent report on the future of aviation until after the next election. He favours a new “Boris island” airport in the Thames Estuary or possible expansion at Stansted. Mr Johnson urged the government to resist the “great Moloch of aviation capacity” and rule out a third runway at Heathrow before the next election. He said it would be “totally nuts” for the Conservatives to go to the polls without having buried the idea. The Mayor told the gathered crowd: “It is just too difficult to deliver – 15 years at least it would take to bring about. “Above all you would be inflicting noise pollution not just on west London but on huge parts of London that don’t even know they are going to be affected. Former transport secretary Justine Greening made her first speech on Heathrow since she was moved to international development in September’s Cabinet reshuffle amid speculation that it was due to her stance on the issue. Business Secretary Vince Cable, who has previously stated that expansion “will not happen”, was also at the rally. Speaking about the event Mr Goldsmith said: “This rally is an opportunity for everyone living under the Heathrow flight path to come together and make clear their opposition to further expansion. “We have done so in previous campaigns, and we will keep doing it until this government gets the message. Zac Goldsmith MP joined by the Mayor of London, the former Transport Secretary Justine Greening, and other local MPs from all parties, and Council Leaders at a ‘mega rally’ to demonstrate the strength of feeling against possible expansion at Heathrow Airport, and to promote the Council’s referendum on the third runway. After a series of short speeches Boris cast the first ‘vote’ in a giant ballot box constructed by pupils and teachers at Richmond Park Academy. This was an opportunity for everyone living under the Heathrow flight path to come together and make clear their opposition to further expansion. It demonstrated to Ministers that if they give expansion a green light, they will face a campaign against it, on a truly massive scale. MPs addressing the rally include former Transport Secretary of State Justine Greening (Putney), Vince Cable (Twickenham), Andy Slaughter (Hammersmith), John McDonnell (Hayes and Harlington), Mary McLeod (Brentford and Isleworth), Angie Bray(Ealing Central and Acton), and Viendra Sharma (Ealing Southall). Posted: Saturday, April 27th, 2013. Filed in News about Airports, Publicity & Politics, Recent News.